Each year at Easter, processions of the Semana Santa take over the city of Sevilla. The Virgins, secluded in their churches during the rest of the year, suddenly go out in the middle of the streets, carried on wooden floats. 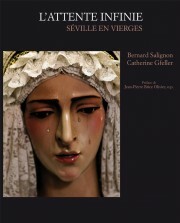 This book is not a sociological explanation; it shows the sensations and the emotions that are released during the Holy Week. The authors have added to the shimmering of the images a fragmented writing to share this contemporary paradox where the sacred and the community meet for a magnificent contemplation and overflowing joy. The images and texts in the book show the rhythm, the movement of this particular communion.